Mussaendas, often known as Bangkok Roses, are popular throughout the tropics and subtropics of the world. Over the warmer, wetter months of the year they grow strongly and provide quite a show in gardens, particularly in northern Australia. You can spot them at a distance, the shrubs being covered with showy white or pink flowers which at times obscure the leaves. While many of the showy hybrid plants dislike cool dry weather, many of the Mussaenda species are a lot hardier and grow in cooler subtropical districts (such as Sydney) in sheltered spots. All is not what it seems with a Mussaenda flower. Take a look at a ‘flower’ and what will first strike you are the large showy ‘petals’ which are in fact enlarged floral sepals. These surround the yellow, cream or white flowers. The starry true flowers are 5 petaled and have a crepe like texture. In the species, generally only one of these large floral sepals is produced per flower, however in some hybrid Musseandas there can be as many as 5 large showy sepals per flower. Mussaendas belong to the Rubiacea family which also includes the Gardenia, Ixora, Pentas and coffee plants (Coffea arabica). Depending on the species or cultivar, Mussaendas generally grow 1.5 to 2.5 metres (5 to 8 feet) tall in cultivation. They benefit from a light annual pruning – generally undertaken just before the start of the growing season as the weather starts to warm and the soil is moist. In the wild, many species grow as rambling climbers and can grow up trees to heights of 10 metres (30 feet). Plants are generally in flower from November to May in Australia and throughout the southern hemisphere (May to November in the northern hemisphere) although many of the species can flower almost all year round in ideal climates. There are over 200 species of Mussaenda which have a very broad distribution from West Africa, through the Indian sub-continent, Asia and down through New Guinea to the western Pacific. One species is native to the Far North Queensland and the Torres Islands. Some 5 species are widely grown in warmer Australian Gardens. Pseudomussaenda, a related genus, once included in Mussaenda, also contains one popular species. 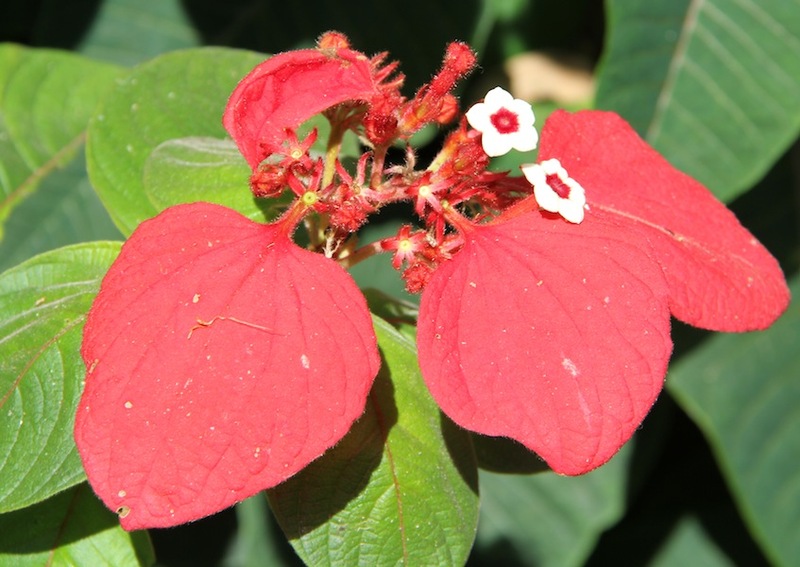 Mussaenda erythrophylla (Ashanti Blood, Red Flag) is native Angola, Burundi, Cabinda, Cameroon, Ivory Coast, Gabon, Ghana, Guinea, Kenya, Liberia, Nigeria, Central African Republic, Sierra Leone, Sudan, Tanganyka, Togo, Uganda and Zaire. This is a sprawling shrub with brilliant red sepals and white flowers with red centres. In the wild it can often climb up surrounding trees. In the garden it can be used as a sprawling shrub, 1 to 1.5 metres (3 to 4.5 feet) high by 2 to 3 metres (6 to 9 feet) wide, or be trained as a climber up a support or an open foliaged tree. 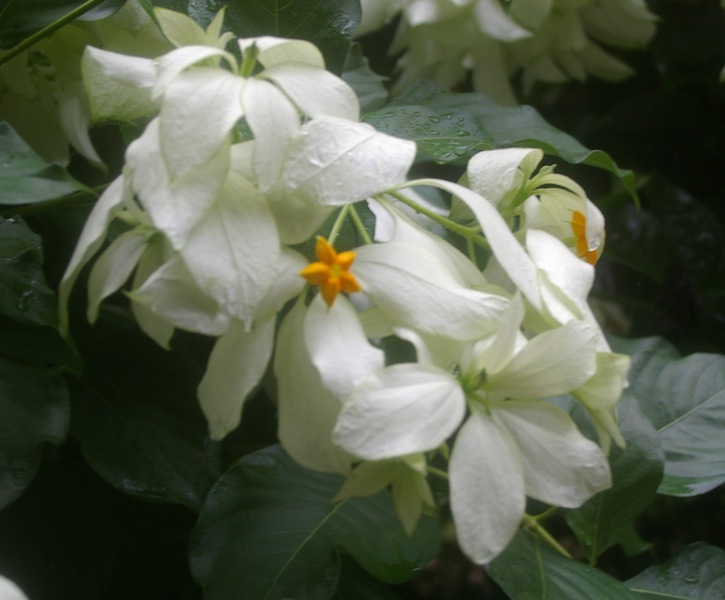 Mussaenda frondosa (Dhobi Tree) is native to India, Nepal, Sri Lanka, Cambodia, Vietnam, Malaysia and, Indonesia. 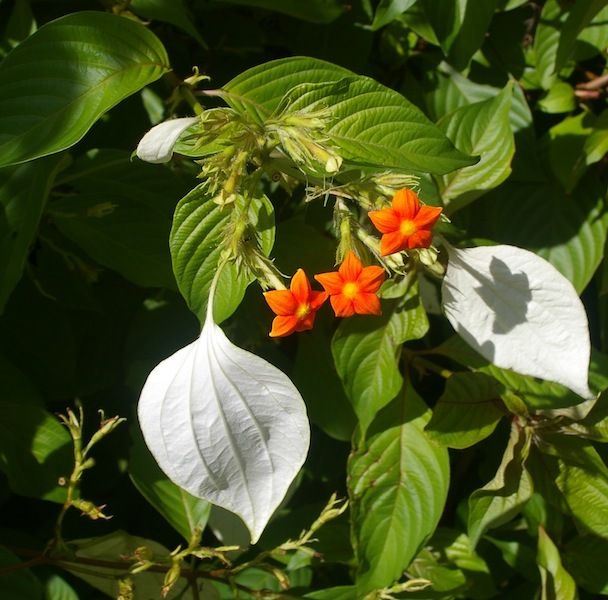 It has white sepals and reddish- orange flowers. It is a smaller shrub 1.5 to 2 metres (5 to 6 feet) tall by 1.5 to 2 metres (5 to 6 feet) wide. The foliage is a lighter green than many other species. Mussaenda incana (Dwarf Mussaenda) is native to India and Malaysia. It has bright yellow flowers and creamy yellow sepals. This is a low growing shrub 300 to 750 mm (1 to 2.5 feet) tall by 1 to 2 metres (3 to 6 feet wide). It looks great if mass planted as a grouncover and deserves to be more widely grown. 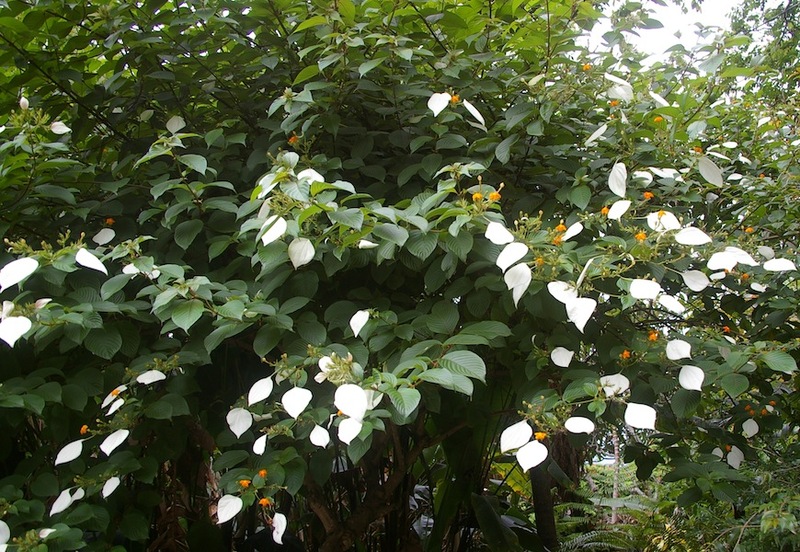 Mussaenda philippica (Tropical Dogwood) is native to the Philippines, Indonesia and New Guinea. The flowers have white sepals and orangy-yellow flowers. It grows 3 to 5 metres (9 to 15 feet) tall in the wild, but in cultivation is more commonly seen as a shrub 1.8 to 2.5 metres (6 to 7 feet) high by 1.2 to 1.8 metres (4 to 6 feet) wide. This species is less widely seen than its well known cultivar Mussaenda philippica ‘Dona Aurora’ (Dona Aurora, Buddha’s Lamp). This was a chance sport first collected in 1915 by Calixto Mabesa on Mt Makiling and then recollected by Hugh Curran and Mamerto Sulit at the College of Forestry grounds at the University of the Philippines Los Banos in 1930. This cultivar has multiple floral sepals (often 5 per flower) instead of just one. This was propagated and dedicated in 1930 to Mrs Aurora Quezon, wife of the Philippines President. This plant is the parent of almost all hybrids. Pseudomussaenda flava (prev. Mussaenda luteola, Mussaenda glabra), (Dwarf Yellow Mussaenda) is native to Ethiopia, Sudan, Kenya, Uganda, Nigeria. 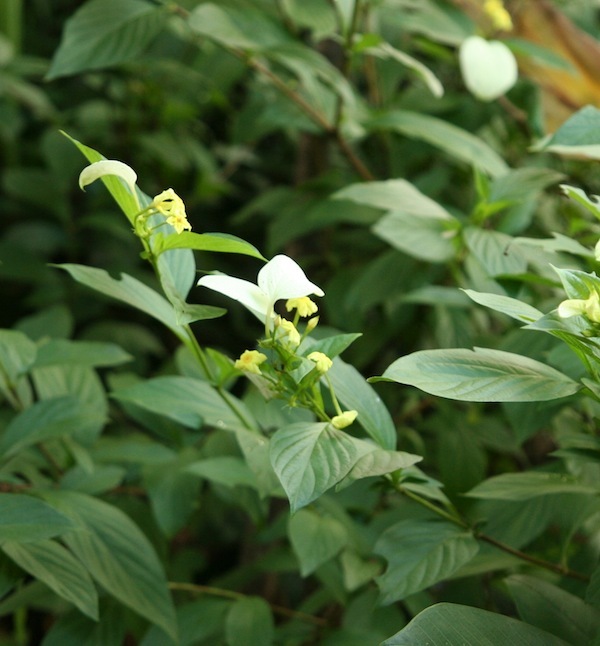 This shrub has white floral sepals and creamy yellow flowers. While no longer in genus Mussaenda, it shares many traits and is the hardiest species, tolerating more dryness and cooler temperatures. You will see it growing vigorously as far south as Sydney. 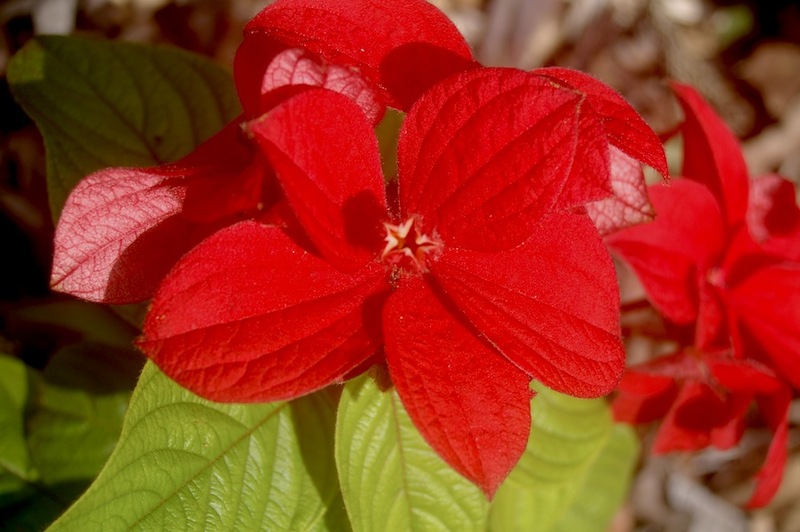 This plant blooms all year round in the tropics and subtropics. The flowers also produce a faint perfume. Hybrid Mussaendas are probably those most popularly grown in warm climate gardens. Hybridisation started in the mid 1940s at the University of the Philippines at Los Banos. 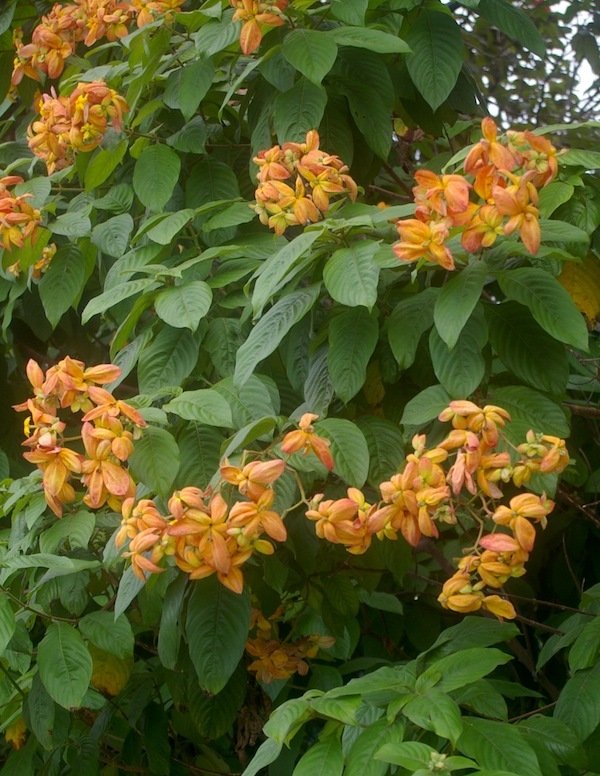 Much of this work was undertaken by Dr Dioscoro Umali, Dean of the College of Agriculture, and his wife using ‘Dona Aurora’ crossed with Mussaenda erythrophylla. ‘Dona Aurora’ does not set viable seed but produces viable pollen. Many of the popular shrubs growing in Australia date from the early days of this hybridisation. Work at the University on the genus has continued to this day, however you will have to travel to Asia to see some of the more recent cultivars. Mussaenda ‘Queen Sirikit’ (Mussaenda ‘Dona Hilaria x Dona Aurora’) is named for Queen Consort of Thailand, the longest reigning head of state in the world. It is possibly the most widely grown Mussaenda in the world. It has multiple pale pink sepals which have a distinct darker edge. Flowers are bright yellow. Following heavy rain, the weight of the flower heads has been known to break branches. Mussaenda ‘Dona Luz’ (M. ‘Dona Hilaria x Dona Aurora’) is named after Philippines First lady Luz Banzon-Magsaysay. It has multiple shrimp pink sepals which are inclined to turn under at their tips. Mussaenda hybridisation has also occurred in India in recent years. One hybrid from this country is grown widely in Australia and around the world. Mussaenda ‘Marmalade’ (Mussaenda Dona Luz x P. flava) is a patented shrub raised from seed in 1995 in a nursery in Alipore, India. This shrub is very hardy and vigorous – the result of having P. flava in its breeding. It grows quickly to 2 to 3 metres (7 to 9 feet) high 1.8 to 2 metres (6 to 7 feet). The shrub is covered with showy yellow and salmon deepening to yellow and orange sepals. They are smaller than many other hybrids, but they are very showy on the bush. I highly recommend this plant. It continues to grow in my estimation. In Australia this plant has been rebranded as Mussaenda ‘Calcutta Gold’ by local nurserymen, which once again causes confusion when the public try to get further information from the internet. 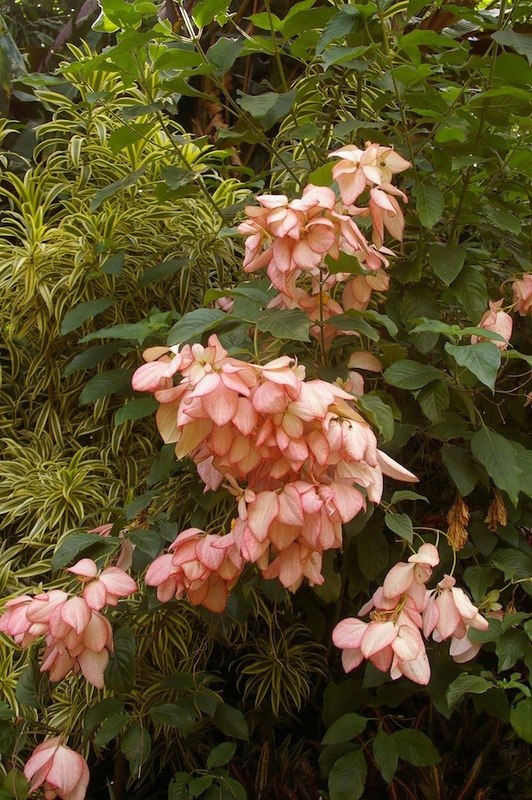 A number of Mussaenda Hybrids have also been developed at Osram Nursery in Rockhampton, Queensland. The first two to be released have proved to be hardy and popular both here and overseas. Further plants are to be released in the future following international plant patenting. Mussaenda ‘Capricorn Dream’ has multiple scarlet red sepals and it makes quite a show in the garden. Mussaenda ‘Capricorn Ice’ – has multiple white sepals and deep yellow flowers. Mussaendas perform best in humid tropical and subtropical areas, although many species and some hybrids will do well in protected areas in warm temperate areas as far south as Sydney. Plants like sheltered locations in full sun to semi-shade, and a northerly to eastern exposure (southerly in the northern hemisphere). Plants thrive in organically enriched fertile soils that have been heavily mulched and where they are regularly fertilised. Like many other plants in the family Rubiaceae, they can be subject to nutrient deficiencies, particularly trace elements. This is all too common in high rainfall areas where nutrients are readily stripped from the soil. I like to use biological fertiliser which includes balanced ground rock minerals. These are more likely to be retained in the soil and released over a longer period. Plants also benefit from regular organic, foliar fertiliser applications. Dilute the liquid fertiliser to ½ the recommended rate and apply early in the morning or in the cool of the evening. Irrigate plants during dry periods as Mussaendas suffer from dryness and can defoliate and die back. While evergreen in the tropics, plants can defoliate and die back in cooler or less sheltered locations over late winter and early spring. It is best to best to prune them just as the weather starts to warm and before the shrubs shoot into growth This is around mid-August to early September (February to early March in the northern hemisphere). As plants increase in size and become more established, they tend to defoliate less frequently. Many people appreciate the plants’ performance during the warmer months of the year and are prepared to tolerate ‘sticks’ during the winter months. In cooler climates, plants can be grown in pots and moved to a greenhouse or veranda during the cooler months. Pseudomussaenda flava, Mussaenda erythrophylla, Mussaenda frondosa and Mussaenda incana are the hardiest species in that order and Mussaenda ‘Marmalade’ is the hardiest of the hybrids. Mussaenda ‘Capricorn Ice’ and Mussaenda‘Capricorn Dream’ are also said to be hardy, and I have seen them both flowering in sheltered Sydney gardens, but being recent introductions, time will tell. Mussaendas tend to be rambling shrubs and benefit from an annual pruning. Generally it pays to remove no more than 1/3 of the growth. If serious renovation is required, it is better to do a series of pruning sessions over a longer period, gradually reducing the size as necessary. Certain species and cultivars can also be trained as climbers, up arbors or along fences. Plants also benefit from removal of dead flowers and bracts throughout the flowering season. Propagation of these plants is from cuttings taken during the warmest months of the year. Some species and hybrids are harder than others and in the home garden they can also be readily propagated by layering. Overseas, tender hybrids are often grown on Pseudomussaenda flava as a rootstock with great success. Mussaendas are generally planted at the rear of garden borders. Being taller plants, their bases are often bare and benefit from a border of lower shrubs or groundcovers. Take care to select plants that are not to vigorous and may compete with these plants. In flower, Mussaendas can be showy, if not spectacular visible when seen from a distance. The hybrids are often covered in showy sepals to the point that the leaves are barely visible. The majority of the hybrids that have sepals that are white and shades of pink and can work well with plantings with complement pastel tones – both flowers or foliage. However a few species and cultivars have brilliant red and yellowish-orange sepals and these plants can be combined well with hot borders and brilliant foliage to create sizzling plant combinations. Mussaendas scream “tropical”, but I have seen them used in cottage gardens with “flowery” perennials. Mussaendas are generally pest free, particularly if their nutritional and climatic needs are met. They can be subject to scale, mealy bug. In turn this can lead to sooty mould growing on honey dew. This seems to be worse when plants grown up against a house where the warm, dry conditions encourage these pests. Have a think about where one of these plants might do well in the garden and earmark that spot …… a warm sheltered northern location where it will get sun for much of the day. Better still, how about a mass planting of your favourite cultivar or species? There is nothing like making a strong statement in the garden! These shrubs are sure to give you pleasure over the warmer months of the year and for many years if not decades into the future. Lovely post, Arno. I love those Mussaenda. I might do a a mass planting of them down near our creek on which to gaze from our back verandah. How long do they take to reach the 6-8ft height? I am thinking alternating the white (phillipica) with the red (capricorn dream). Mussaendas really put on a great show in the warm climate gardens don’t they! Regarding growth rates, this will depend on location and you! If you prepare the soil well, provide balanced nutrition and keep them well mulched you can get good growth rates – however most are probably not fast – which I think is great in our climate. We need slow growing plants or we won’t be able to keep up with the ongoing maintenance, particularly on larger blocks. They are a variable lot however and the species plants (particularly M. erythrophylla are quite vigorous. Regarding placing down near the creek, this makes me think it is one of the cooler, possible shadier parts of the garden and doesn’t sound ideal to me. Mussaendas like warm and protected areas and in the subtropics, the hybrids want a little bit of love for best appearance. Re alternating plants – personally not a great fan of this for two reasons. The plants will have different rates of growth and I suspect M. phillipica will take over. From a design point of you , if viewing from a distance, you will want to provide planting which is in scale with the overall view, which suggests to me plantings of at least 5 to 7 of one cultivar to make an impact. Being a designer, I always suggest gardeners consider the surrounding area and the overall composition before making plant selections. Perhaps you should consider other areas of the garden where plants are flowering at a similar time (over the warmer months) and plant Mussaendas where the flower colour and character of the plants will complement and support adjacent plantings. Finally most gardeners don’t consider scale. Generally shrubs work best in mass plantings of one cultivar. If you are on acreage the scale is larger and larger plantings are needed to make an impact. Have a look at pictures of some of the ‘great’ gardens you enjoy and you will see how plants are used like brushstrokes of colour or texture to create a composition. Mussaenda erythrophylla – evergreen in subtropical Queensland – LOVE IT!!! Pseudomussaenda flava – a favourite of mine. Hi Vicki – I have tried to locate a mussaenda for you in WA but no luck at all. The general consensus among my WA experts is that it would be too dry to grow them there as they really need high summer humidity, and they’ve never seen one in WA. It seems that your quarantine laws makes it impossible to import one now so unless you can find one in an old garden to propagate, it’s not possible. Sorry! Mussaenda can produce a fleshy fruit but it’s not common which is why they are usually propagated vegetatively. They flower right through summer so I don’t think they’d set seed until autumn. However even if you could find one with fruit, I am sure you would not be able to take a fleshy fruit back into WA with you. yes I think I will have to agree with Catherine, Mussaendas may be tricky to grow in Perth. They will not appreciate your hot dry summers. I would focus on M. erythrophylla or P. flava which seem to be the hardiest species. It is amazing what you will find in Perth gardens once you start asking around. However the big question will be, is it worth the effort if the plants will never thrive. Nothing looks worse than sickly plants in a garden. Many people in South East Queensland struggle with Kangaroo Paws which dislike our wet summers and never look as vigorous as they do in Perth. Perhaps we should appreciate these plants in the places they do well. Can u please help me? How to make babies from Mussaenda. A gardener from Tanzania east africa. Mussaendas are generally grown from cuttings over the warmer and wetter months of the year. Use semi-hardwood cuttings. Trim off the soft succulent new growth and flowers and then take a cutting about 200 to 300mm long. Then go ahead and trim off all but the top 2 sets of leaves. Trim these in half. Dip the cuttings in honey and then place in a pot of potting mix and place in a shadehouse or humid environment. Keep the cuttings moist and the surrounding area damped down for humidity (if it is hot or dry). They are generally easy to grow from cuttings. Cutting grown plants will be true to type. I took a cutting from a lovely Bangkok Rose and placed it in a small pot. The cutting sprouted leaves and looked healthy.I transplanted it into a larger and final pot destination. Now the cutting has lost its leaves and is just a stick with no sign of buds or leaves. I live in Port Douglas, Qld and water the plant and also fertilised. What can I do to save the plant or is it now a former Bangkok Rose ? Sorry to hear that your cutting is not prospering. It’s hard to work out what might have happened to your plant, but perhaps the tiny roots were damaged during transplanting. I would suggest taking some more cuttings and letting the roots become a little more established before transplanting into a pot. I would use premium potting mix and plant in a small pot and gradually repot into a larger pot as the plant grows. Perhaps you can grow a few cuttings and the ones that are excess to your needs you can give to friends. Is there anyone that knows where I can find a Mussaenda erythrophylla in brisbane. A red banksia rose is what they are I think. My Nanna is a freak for them. She has many of the colours but she has been hunting for a red one for over 2yrs and has been unsuccessful. I have now taken over her search for her. Can someone help us please?? If you can’t make it to Dennis’ beautiful garden, I have just seen some M. erythrophylla for sale in the nurseries. They tend to be seasonal being available over January to March, when they are in full flower. M. ‘Capricorne Dream’ is also widely available and has similar red sepals, but more of them – and is a little more compact in growth. Good luck finding the plants. from your description this pest sounds like it is Mealy Bug. This is a common sap sucking insect that can impact on the plants health and vigour. Whereas many people head straight for the pesticide and spray the plant, I find that Mealy bug generally attracts predators very quickly ands often they look just like the mealy bugs themselves. The insecticides can kill these predators and other beneficial insects as well as dripping down into the soil and harming the micro-organisms in the soil – which are essential for plant health. A better course of action is to ensure the plant’s health is optimal. Healthy plants tend to attract few pests and diseases. If you live in Queensland or Singapore, your plants may be stressed from the continued dry weather we have had. Ensure their water needs are met with. Next ensure their nutritional needs are met. Mussaendas belong to a family of plants (Rubiaceae) which can suffer quickly if their nutritional needs were not met. My preference is for biological or organic fertilisers which contain micro nutrient / trace elements (often in the form of ground rock minerals). Apply at recommended rates and water into the ground. Finally applying a biological or organic foliar fertiliser at bimonthly or monthly intervals can do wonders. Often there can be an overabundance of specific minerals in our soils which limit the absorption of other key minerals. There can also be plants nearby which compete aggressively for nutrients. Foliar fertilising bypasses these issues. I generally use half the recommended rate when applying a foliar fertiliser – spraying it on the foliage. I also like to add seaweed solutions with the foliar fertiliser, again added at recommended rates. These products seem to enhance the uptake of the fertiliser, boost vigour and also seem to discourage diseases and pests if used regularly. Don’t ever user a sprayer which has been used for applying herbicides. Apply fertiliser late in the afternoon or early evening or early in the morning. Try to avoid spraying when rain is predicted as this will wash it off the leaves. Some companies that produce products which I use in my own garden and with which I have had great results include Nutritec Solutions, Organic Crop Protectants and Plant of Health. You will find information on these companies, their products and suppliers online. Your plants should respond to the watering and fertilising regime and become lusher and greener. In turn the mealy bug should disappear or be minimal and have little impact upon your plants’ vigour. Addressing your plants’ health rather than the pests on them is a much quicker, cheaper, more enjoyable and longer term strategy to growing a beautiful garden. Good luck with your Mussaendas. I recently planted (2) dwarf mussaenda and the one that’s under a palm with partial shade looks good… the other (no shade at all) seems to wilt. I don’t want to over water…. :/ I’m watering 2x early morning and evening, I’m in S Florida…. it’s been sunny and in the 90’s. Please help! It sounds like your plant is losing more moisture from its leaves during the day than it is able to take up through its roots from the soil. This happens with some of the plants in my garden during very hot periods. As they rebound quickly, do not wilt and grow vigorously at other times, I generally ignore this habit. However there are many things we can do to minimise wilting on hot days. The best thing is to ensure the soil is well covered with an organic mulch some 50 to 75mm (2 to 3 inches) at all times. If your soil is sandy, this can exacerbate wilting as these soils drain rapidly. Topdressing with compost, gritty clays (if you can source them locally) and zeolite can improve the water holding capacity of the soil. I would also add humates (humid acid, leonardite) to the soil. It comes as a granular product, which looks like instant coffee and you add to water to create a brown tea. It is amazing stuff as it also improves mineral retention and enhances soil microbial activity which is beneficial to plant health. Plants rely on a symbiotic relationship with the soil biology to absorb water and nutrients so enhancing conditions for these organisms by switching to an organic or biological approach, and minimising pesticide, fungicide and herbicide use may also enhance the health of this plant and other plants in the garden. Good luck with your plant and let us know if you have success. I was looking at a Mussaenda plant the other day. Never saw such a beautiful plant. In researching it I came upon a web site that said certain plants should not be planted near the Mussaenda plant. But did not list them. Can you help me so I can decide where to plant it in my yard. I live in southwest Florida so the climate is perfect. Just have to figure out where to put it. Thank you. I find Mussaendas do best where they are not competing with more vigorous plants and where they get sun for part of the day or enjoy very light shade. I would avoid planting them close to large trees or large palms with very vigorous root systems. I would also avoid planting them close to very vigorous fast growing shrubs. However sometimes we are forced to grow plants where we have room for them. In this case I would thoroughly prepare the planting hole and then ensure the plant is well watered during dry periods and fertilised during the growing season. You may also consider foliar feeding if your plant is not growing vigorously due to competing plantings. Use half strength liquid organic or biological fertiliser and apply early in the morning or late in the evening over the warmer months. I hope your plant does well. Very nice to watch ! I enjoyed much ! Quite useful ! I think you should be able to move your Mussaenda. I would undertake the move as soon as the ‘wet’ arrives, bringing with it guaranteed rain and humidity. Prepare the new location well, digging a good sized hole and improving the soil in preparation for the planting. I like to ensure the plant is facing the same way and tie a ribbon facing north on the shrub in preparation for the move. Prune the shrub back by half and ‘trench’ around the shrub. This is digging a trench, around the plant and then replacing the soil back into the trench. I would make the inside edge a minimum of 500mm from the base of the plant. Ideally this is done a month before the move. Moving the plant will be the biggest operation. The easiest solution is to get a small tractor or excavator in to move the plant – if this is possible. The other option is to have a few friends over and some hessian, polythene or shade cloth at hand. You want to open up the trench again and then slice off the roots some 500mm down below the plant so it becomes free. Then it is best to wrap and secure the rootball with the hessian or polythene to keep it intact. Move the plant to the new hole. Orient it back in the same direction (using your ribbon). Then fill under the plant to ensure it is the same height in relation to the surrounding soil level. Slide out the wrapping material and backfill with prepared soil. water the hole well and top up with more soil if necessary. Apply an organic mulch 50-75mm deep. Aftercare is the most important issue. Ensure the rootball is kept moist. Stake the shrub if it moves in the wind. I would avoid fertilising the shrub until it is growing strongly.Then little, often and organic is the best strategy. thanks for the feedback. Its great to hear that Mussaenda flowers well for you in both sun and shade. Manuwae nursery at Buderim often had them for sale as well as the Yandina markets. thanks for the email. I hadn’t realised that the Philippine hybrid Mussaendas would grow well so far south. I regard them as the most temperamental of all the Mussaendas we grow. The location you chose with a northerly aspect, close to the house is obviously the ideal microclimate in the garden. Thanks for sharing your maintenance regime as this is valuable information for other gardeners. Mussaendas grow in Sri Lanka especially in the Southern parts as the weather is a bit cooler there. Most of the home gardens have a few variety of Mussaendas. Most common colours are red, pink, and white. I really like this plant but, I am currently living in Canada and I wonder if I could get this plant anywhere in Canada. We have many varieties of Hydrangea plants grow in Canada and is Mussaendas plant a close family to Hydrangea Plant? If so then we should be able to plant Mussaendas plant in our gardens. I was recently in Sri Lanka and also admired the Mussaendas in many of the gardens that I visited. In regards to your question about growing them in Canada, I don’t think they would survive in the ground during your cold winter months. In the USA they seem to thrive only in South Florida ( although I have read some people cover and nurture them in Southern California and North Florida). In general you could say they will thrive where you see coconut palms growing – although some species such as Pseudomussaenda flava are a little hardier, they are still frost tender and require a long warm growing season to grow well and flower. There is a possibility you could grow the plants in a pot outside over the warmest months and then have a rental arrangement with a nursery or garden centre to look after and maintain them for the rest of the year. Perhaps you might be better off growing hydrangeas? By the way they are unrelated to Mussaendas, which belong to the coffee family, Rubiaceae. Hydrangeas are in the Hydrangeaceae. Your prompt and informative reply is greatly appreciated. I am considering of growing Mussaendas indoors, but none of our garden centers in Canada carry Mussaendas plants. I have seen Mussaendas plants in Florida and California as well in Sao Palo Brazil during my travels. They are certainly eye catching plants and their vibrant colours are breathtaking. I will keep you informed when I get one plant to grow indoors. Thank you for your guidance. No one has mentioned Hawaii…I am in love with that beautiful plant. Am looking for the pink (Queen Sirikit. How will Mussaendas do here in our tropical climate? hope you can help. I live in Townsville Nth QLD and I planted 2 baby Donna Luz in shade as up here the summers are very warm and VERY humid. Well lost both of them at about only 16cms high. I really want to grow some Mussaendas so what am I doing wrong and also in our region what would be the better ones to grow? I often visit Townsville and you grow some of the best Mussaendas up there. In fact you have a much better climate for growing these plants than down here in South East Queensland. Originating in the Philippines and other parts of South East Asia, Mussaendas thrive on warmth and humidity. When they are young Mussaendas may sometimes defoliate during cooler and drier weather. Your plants may have simply defoliated, or you may have let them dry out and they died from lack of water. My suggestions to you are: Find the best place to locate your plants. They will grow 1.5 to 2.5 metres high and wide. The plants I have seen and photographed in Townsville were growing in full sun or light shade for part of the day. Dig some large holes and amend the soil with organic matter. Remember – $10.00 hole and $1.00 plant. Take a sample of your soil (before amendment) to your local garden centre to check the pH (acidity/alkalinity of the soil). It should be between 6.5 and 7. The staff will help you if the soil is outside this range. Plant your plants and mulch the soil (but not up against the base of the plant). Keep the soil moist during dry periods. This might mean watering once a day during hot weather and twice a week once it has cooled down. I find that the species and ‘Marmalade’/’Culcutta Gold’ are the hardiest of the Mussaendas, however ‘Donna Luz’ also thrives in Townsville. Oh yes – mussaendas… I did not have a single clue what this naked & bare tree near our pool was when we moved to Maggie 3 years ago. Have to admit that I was close to chopping it down – what does a stupid German gardener do with a seemingly dead tree ? For whatever reason I forgot about this project – and “boy”, was I surprised when this tree suddenly decked itself out in green & white – spectacular ! Some research brought to light the wonderful world of mussaendas, and more & more of them find a home in our – wee too small – garden. Oram’s is working on several new & unreleased hybrids, and intense breeding is going on in the Phillipines, India & Thailand, so there is definitely more to come. And they are so easy to propagate – in water cuttings develop roots within weeks. Definitely a tree that does not disappoint in the dry tropics ! You have brought up a good point, it pays not to do anything in a new garden until you have been there for a year or so and learnt what you actually have there. I see too many people rush in as soon as they have bought a new property and chop everything down and start all over again. Often the garden is full of beautiful low maintenance plantings, only to be replaced with poorly chosen, short lived or high maintenance plants. Yes Mussaendas are stunning shrubs. I agree with you that Orams nursery have some stunning unreleased hybrids, some of the best Mussaendas I have ever seen and I hope we will see them released over the next few years. In recent months I have seen a few more Mussaenda cultivars released or available once again. These include ‘Snow Queen’, ‘Paraluma’ and ‘Dona Eva’ so keep a look out for some of these plants. Arno, thank you so much for your quick reply and the information given. Before I go out and purchase more Mussaendas would the Dark Crimson coloured one (from Rockhampton I think) also do well here in Townsville or better sticking to the 2 you mentioned? The dark crimson Mussaenda you mentioned is ‘Capricorn Dream’ from Orams Nursery in Rockhampton. I have found it quite hardy in my own garden and Would recommend it as well. Ultimately, if you find the appropriate location; dig a good sized hole and amend soil appropriately; and look after you plants for the first year or two, you should have great success with any of the plants mentioned in the article above, so it may simply be a case of picking the cultivar you like the most. I instantly fell in love with this amazing plant. Originally from NY, since moving to Florida 8 yrs ago, I have not been this excited about a plant! I immediately purchased seven of them, four in a row in front of my trailer and three in a bunch off the side of my entrance. I dug decent sized holes, added potting soil, granular fertilizer for flowering scrubs and lots of mulch. They get full sun with partial shade from a nearby tree and are doing fantastic! Growing and blooming like crazy and it’s been one month. I planted them mid summer here in west Palm beach Florida – perfect time with lots of rain to get them established. So far I have had at least a dozen people compliment and ask what they are and I am eagerly spreading the word – Mussaenda!! Great to hear you are enjoying gardening in west Palm Beach. You will learning a whole new set of gardening skills and a totally different plant palette now. Mussaendas are just the start. Plants grow a lot faster as well so you will be amazed how quickly the plants will establish. Timing planting with rain is the secret for success. I’m glad you are spreading the word. There is such a paucity of gardening material for subtropical and tropical climates. I do have one small concern that you may be able to help me with? Although my plants are blooming and doing very well, I do get some green leaves that turn yellow with some black on the edges. Could it be because they are nearing the time leaves start to fall? Often when plants are newly planted they take a little time to establish. Typically, I would expect the older leaves to yellow and then fall off – without the black tips. Black tips often signify too much, too little or erratic watering. They can also suggest nutrient deficiencies or excesses. As you plants are newly planted, I wouldn’t worry about it too much. It is probably transplant shock. I would however make sure that you water during periods of drier weather to ensure that plants do not dry out. This will happen much more quickly in Florida than New York. Conversely, you need to make sure the plants do not sit in water during or following rain. I do not know your soil type, but I have read that a lot of soils in South Florida are quite alkaline. Mussaendas like a slightly acid to neutral soil. If the younger leaves start to yellow, this may be an issue to address. Your local garden centre/nursery or garden club will be able to help you with some of these local issues. But given all above, I suspect black tips are simply transplant shock and as your plants establish will disappear. Thank you for your expert advice Arno! I will get my soil tested and keep you posted. Most of the time the leaves- not many but a few (some old, some new) turn yellow and some turn brown at the tips. I have a newly planted angel trumpet plant next to them also doing the same thing but no brown at tips. Overall they are very healthy looking and have already grown quite a bit, flowering like crazy 🙂 LOVE this plant! Hi Rose – can you give more detail about what you’d like to know? Hi Arno,I have a few Donna Luz and a calcutta sunset, all growing well. I would like to add a white plant to my garden. do you what differences there are between Capricorn Ice and Donna aurora? Its not so easy – there are actually 3 white mussaendas with the multilayered sepals available in Australia – ‘Dona Aurora’, ‘Capricorn Ice’ and ‘Snow Queen’. I didn’t know ‘Snow Queen’ was commercially available until I visited Orams wholesale nursery in Rockhampton. I have not grown ‘Capricorne Ice’ but I grow ‘Dona’ Aurora’ and ‘Snow Queen’ and they are both reasonably hardy plants – more so then ‘Dona Luz, which you are currently growing. I would not have spotted the difference between these 2 plants if I was not shown plants growing side by side, the sepals on ‘Snow Queen’ curl under whereas they layer on top of each other on ‘Dona Aurora’ creating quite distinct appearances. ‘Capricorne Ice’ seems to have stiffer more rounded sepals which are arranged in fours. Ultimately, they are all stunning plants and it may simply be an issue of which of these plants you can source. I like them all but probably have a soft spot for ‘Dona Aurora’, due to the layering of sepals and the appearance of softness this creates. Good luck with sourcing plants. Young plants are generally available this time of year as they are starting to come into flower and grab custom’s attention. Thank You very much for taking the time to reply Arno. I agree they are both lovely,I had not heard of snow queen. It’s now end of December and since planting my Mussaenda ‘Queen Sirikit’, all 7 plants are doing great. Have grown to almost twice the size. Still blooming and still has pink blooms and all its leaves, except not as full. It’s been a very warm and rainy fall into winter here in west palm beach Florida. I had a question to ask. One of the plants closer to a small palm tree (gets some shelter and shade) is getting a fuzzy white mold on the stems near the end of the blooms. I also notice tiny pale yellow spots on some leaves (same plant). This is not on the other plants that are more in the direct sun. I’m glad to hear your Mussaendas are doing so well. They may start to defoliate a little as it gets cooler, but don’t worry as they will burst back into growth as the weather warms. With our any photos, its hard for me to give you a definitive answer to the your question about the plant closest to the palm, but I have some suspicions about what is going on. Palms can be quite hungry creatures and often we find there can be competition when these plants are located close to one another. I suspect this ‘last’ plant is having more of a battle with nutrition. Over the coming years it may not grow as fast as other plants for this reason. The ‘white mould’ may be mealy bug, a slater/woodlouse like insect that produces a white waxy protection. It is adored by ants so if you see ants nearby, this will confirm the ID. I ‘m not sure about the yellow spots. Perhaps you can email some photos? I really don’t think you need to worry too much about the mealy bug. There are a number of insecticides that would soon dispatch it. However I find that this insect usually avoids vigorous strongly growing plants. The way to get this ‘straggler’ growing well is to give it a little more fertiliser than the others and to lalso feed the palm. Alternatively you can use a foliar fertiliser, applied to the leaves of the mussaendas. However, now that it is cooling down in your area, I would wait until next spring before fertilising again. As soon as your plants start shooting away in April or May, you can start monthly fertilising – following the manufacturers instructions. See if you can find some organic fertilisers with ground rock minerals or rock dust in them. These can often work a lot better in warm climates with heavy rain than the standard soluble fertilisers and they don’t leach so readily. Your plants will grow more strongly and the minerals will stay in the soil – so you save money and don’t need to apply fertilisers so often. Good luck with your plants. It seems like you are doing a great job. Mussaenda frondosa isn’t so popular these days, now that all these multi-sepalled cultivars are being grown. I like it because it is so tough. I saw it for sale in a few nurseries last year, but can’t find out who is growing it. The next 3 months are the best time to source Mussaendas so keep searching. I will let you know if I can find a source. Have you thought about trying some cuttings? Now is the time to put them in. Thank you for taking on my problem and your advice and will be tenacious about the nurseries. Now I have some hope. I have thought about cuttings, but it would take too long for my neighbour, and besides not too sure that she would let me have any (she has it in a pot and the growth has been stunted, I’m dying to rescue it and put it into the soil). Also my husband is elderly and I would like him to enjoy a developed one. Hi, Thanks so much for all the knowledgeable information. I just purchased what I believe is Mussaenda philippica It is very leggy. I am wondering should I cut it back to sprout new growth or will the tree stem develop growth to look like a bush instead of a standard? You have brought up a good point. Often Mussaendas are quite leggy when you buy them from the Garden Centres. This is the habit of the younger plant, particularly when grown commercially. I generally try to minimise stress to newly planted plants and allow them to get established for at least 6 months to a year before giving them a good prune. This allows the roots to get well established and the plant to start growing strongly. The best time to prune Mussaendas is as they surge into growth in early to mid spring. Given the recent planting of your Mussaenda, it may pay to wait a year until you prune and by then your plant will be well established. Mussaendas respond well to pruning, and generally on a young plant this would be no more than a quarter of the plants growth each year. Once the plant is established, aim for no more than 1/3 of the shrub’s canopy each year. If plants are neglected and a larger pruning is needed it is best to do one half of the shrub first and then the other half, or two sets of consecutive 1/3 prunings to bring canopies down to size. In cooler subtropical areas avoid pruning or disturbance during the cooler months. M.frondosa grows luxuriantly at Waterfall Cottage Sydney as your photo shows Arno and I am sure Jeanne Villani would provide cuttings if wanted. As someone who pruned her i.e. that bush back hard I can vouch that it bounced back and thrives so 50% pruning is ok as is poor sandy soil. A good companion is Ruttya fruticosa or Chinaman’s hat bush with lovely graceful arcing branches and cooked apricot-rusty flowers. Stuart. thanks for the feedback regarding growing and pruning Mussaenda frondosa in Sydney. Yes Ruttya and Holmskiolda (Chinaman’s Hat Bush) are very tough shrubs that would make great companions. I often feel that the combinations of the plants we use together are as important as the plants we chose. Some plants really ‘shine’ with well chosen partners. The European and Asian gardeners often do this really well and I think we could learn a lot by reviewing the atmosphere these combined plantings evoke, rather than the individual plants they use. I saw a Mussaenda frondosa in Washington D.C. this summer and have been looking for seeds from it since. Any idea where they can be purchased ? I wonder if what you saw was a Cornus in flower. They can look a little similar. Mussaendas are quite cold sensitive, so you would be more likely to see them in warm, coastal areas in southern Florida. You would need a large heated greenhouse to grow them in Washington. The plants we grow are generally selected clones and therefore propagation is by cuttings rather than seed. Well done Arno. i really love mussaenda hybrid. I am in Tanzania, how can I get a plant? HI Esther, I can’t find a plant nursery in Tanzania that sells Mussaenda. The nearest to you are Golden Stairs Nursery in Harare in Zimbabwe, which has it on its shrub list. http://www.goldenstairszim.com/shrubs—sun.html and also this nursery in Nairobi, Kenya http://plantsgalore.co.ke/plants3.html . I don’t know whether either of those nurseries send plants to Tanzania by mail order but it’s worth contacting them to ask. I live in Valla Beach near Coffs Harbour and have loved the Mussaenda for many years, since we lived in FNQ for a while. I’ve have a Dona Luz which I planted when we moved here 14 years ago. It gives a marvellous show every year and is now about 7′ high (but, as you say, is “sticks” in Winter). I also have one Capricorn Dream which I had shipped down from Cairns in 2012 and it put on a magnificent show last Summer. I have one Queen Sirikit which I bought at Bunnings about two years ago, which is also doing extremely well. I’ve just purchased, from Limberlost Nursery in Cairns, three Capricorn Dream and another Queen Sirikit (but also having to pay the added expense of a large DPI fee in order to ship the plants interstate…… but I really wanted them, as they’re so special). My problem is with the Queen Sirikit in that, because the shipping took five days, the plant has lost all its leaves but still has a large amount of sepals on two stems, each stem about one foot long. I’m in a quandary as to whether to prune off these sepals in order to give the plant more energy to create new leaves (and I’m also concerned about the flowers being admired and the plant being stolen from the front garden whilst it’s still so small). What do you think would be best please, pruning off the flowers or leaving them? If I prune them off it will only leave bare stems. my apologies for taking so long to get back to you. I always suggest removing the flowers and sepals, as this encourages fresh growth. I hope your Queen Sirikit plant has burst into new growth and is now thriving in the garden. Hello Arno. I live in south Florida in Martin County A nursery near my home has an amazing Mussaenda “tree” at their place. it is a salmon color and beautifully showy when blooming most of the year. A cold snap in the weather seems to cause it to lose its leaves but it does grow back nicely. I would like to train one to grow as they did…tree like. They have a 3 gallon red one there but it is very sparse and they are asking $30. for it. I feel it is an overprice given the condition of the plant. How do these plants do in south Florida and do you have any idea where I might find a better selection of the Mussaenda? Thank you for your help. Hello Roseann – theres some excellent information about growing Mussaenda in southern Florida here http://bougainvilleas.us/wp-content/uploads/2010/09/Mussaendas_for_SFLandscapes.pdf. I suspect the potted plant you’ve seen for sale in the nursery is looking a bit threadbare as it comes through the cold of winter. Pseudomussaenda flava, Mussaenda, love the plant but I keep getting like a small green bug mite that attacks new leaves and flowers if I let them go for a long time, is there anything I can do to keep them away from the plant! I’ve never seen this insect on Mussaendas myself, so I’m not sure what it might be. I find that some of the better quality neem oils, applied several times and nominate intervals are great for control of these small sucking insects. However I would also look at cultural issues, as insect problems are often most common on plants which are not growing vigorously. Mussaendas are sensitive to nutrient deficiencies, so applications of balanced fertilisers containing trace elements are important. With the heat and irregular rainfall we have experienced, water stress may also be an issue. It sounds like your Mussaenda has succumbed to a soil borne fungal disease. In all fairness I think 20 years is a good run, but I know of many Mussaendas in your region that are a lot older than this. The plant may have succumbed because growing conditions were not ideal in the location it was growing; for example it might have been too poorly drained. It may have also succumbed because it lacked vigour and this may be linked to plant nutrition. There are many things you can do to avoid it happening to your other plant. Mussaendas belong to the family Rubiaciae, and these plants are known for declining in vigour when nutrition is not ideal, particularly when essential micro-nutrients are not available. In the wet tropics essential minerals are leached from the soil during heavy rains. To address this issue, apply an organic fertiliser containing ground rock minerals and humates to the soil around your plant at regular intervals. The minerals in these fertilisers are in the form of various rock dusts which are mixed to provide the 26 essential minerals in appropriate proportions. They sit in the soil and do not leach, but are made available to the plant by various symbiotic micro-organisms and thus are the ideal and most economical fertiliser for your region. Conventional fertilisers, commonly available have been designed for growing temperate crops quickly in cool climates which have light rains. They are not economical in your climate and readily leach through the soil profile and contaminate ground water and waterways. The humates (or humic acid) in the recommended organic fertiliser help to hold nutrients and water in the soil and also provide an environment suitable for the beneficial micro-organisms. The final thing is to ensure there is a 50 mm layer of organic mulch within the drip line outer branches) of the shrub, but not up against the trunk of the shrub. The organic matter encourages diverse microbial activity in the soil, and this biodiversity and competition makes it less likely that a harmful soil fungi will become established in the soil and impact on your remaining shrub. I would also plant 2 more young Mussaendas as a backup in other areas of the garden to provide a succession plan and ensure that you enjoy these plants in the future. There are some great new cultivars available and I am sure you will enjoy hunting for them at your local garden centres. I hope you have many more decades of enjoyment from these plants. I live in South Florida and purchased about 20 mussaenda philliipica to plant in a row as the rear shrub along the front wall of my house. How far apart would you suggest I plant each one (they are small – about 2 feet in height). I would also like to plant something in front of it – in a row – that would possibly obscure the base/legs. Do you have any suggestions? I am brand new to gardening/landscaping. I have a Mussaenda tree red that looks dry and leaves are yellowing and this happen on and off during the year. It receives morning and afternoon sun . I live in Hu. I don’t fertilize regularly. Would this be a problem ? Is spraying with Epsom salt in foliage and applying Epsom salt on the ground help? Would love to find sources for Mussaenda plants in very South Florida — Miami area. Any referrals would be greatly appreciated. And would love to connect with any local growers, commercial or household gardeners. I’m sorry to hear your Mussaenda plant is not doing too well. I suspect it may be an issue with watering (too much, too little, or too irregular) or not enough light. I seldom see Specimen Mussaendas grown in pots, so I suspect they are one of those plants which is best grown in the ground. I would suggest planting your plants 21/2 feet (900mm) to 4 feet (1.2) apart. Its a little difficult suggesting plants to place in front of them, not knowing the garden or locations. The yellowing leaves suggest the plant is not happy. Could it be lack of water during dry periods? Mussaendas enjoy fertile soils and can look untidy if hungry. I would suggest taking a soil sample to your local Garden Centre to test the pH. They may suggest applying a dusting of garden lime if your soil is very acid (less than 6.5). I think your plant would benefit from regular applications of a balanced organic fertiliser, preferably one that contains ground rock minerals. Ask your Garden Centre for a fertiliser that contains trace elements. Apply the fertiliser according to manufacturers recommendations during the rainy season. I would also suggest applying an organic mulch around the base of your plant. I know from other readers that Musseandas are widely grown in the Miami region. I would suggest using google to find some local garden centres. You can contact your local Botanic Garden to find out more about local growers and gardeners. They may be able to give you the name of the local garden club. I’m wondering whether you could advise me on where to plant my Musseandas. I have about 3 meters at the end of my decking before my fence. The decking surrounds my pool so I’d really like something beautiful around it. I was thinking of having some Heliconia Hot Rio Nights up against the fence and then my Musseanda infront of them with perhaps some smaller shrubs below it. Do you think this will look good? Or will it be too crowded? I wonder if the plants will fight for space? What shrubs would you recommend as ground cover below the Musseanda? Thanks in advance for your help! Much appreciated. I think a Mussaenda near your pool would look great. Remember that a thriving shrub will end up 2 to 3 metres wide, and a Heliconia ‘Hot Rio Nights’ could be 2.5 to 4 metres wide. I think it’s a case of going for one rather than both. Mussaendas can look a little bare at their base, so I think it’s a good idea to have some low shrubs or perennials at the base of the plant. There are so many plants to chose from, and its a case of matching plants with similar flowering periods or that reflect the overall character of the garden. Its sounds like it has a tropical theme. Good luck with the planting. I just planted 4 Mussaenda plants along my fence in Bangalore, India, keeping a distance of about 1.5-2 feet between them. Reading your posts, I am concerned if this is too close together. These are pale pink, about 5 feet in height and look thin/tall (just got from nursery). Pls advise if I need to replant them. If yes, what is safest way without damaging them. Just planted them today. I searched Google but unable to get. My pink mussaenda was beautiful and healthy until a few days ago. It’s about 3 years old now. All of a sudden, its leaves are browning at the edges and falling off. The plant is full of small black ants. I tried a common pesticide but within 5 days the ants were back, so I’m guessing there’s a pest. I was looking for a solution when I chanced upon this site. Can you please help me?